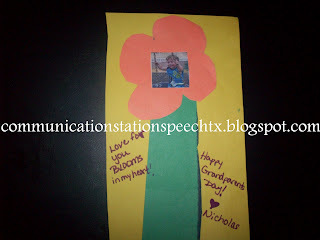 Grandparents Day Craft/Card: A simple language activity! Making a craft together with your child is a GREAT way to facilitate language. 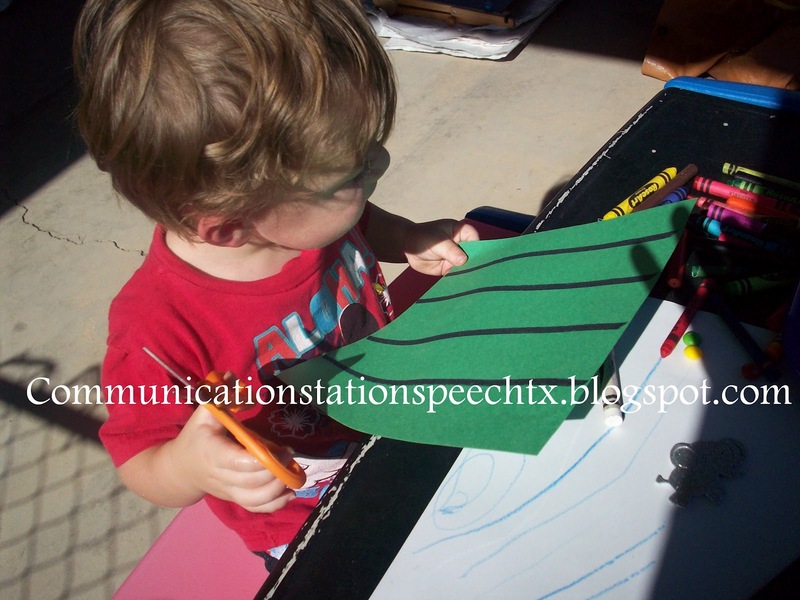 Your child learns the function of craft objects as well as several simple vocabulary words (“stickers, construction paper, scissors, glue, markers, paint, painbrushes, etc” as well as color names)! In addition, you can practice following simple one-step directions, multi-step directions, and/or directions using location concepts (using prepositions such as “on, next to, above/over, below/under” etc.). 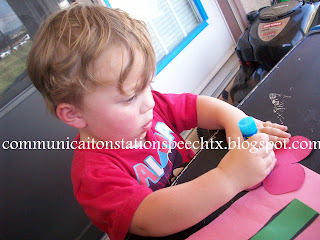 If you are working on correct speech production, fluent speech, social skills, or correct use of voice (volume, pitch, etc.) ANY language can be used to target those goals. Ask your SLP for guidance or comment below and I will try to help you modify a craft activity accordingly. 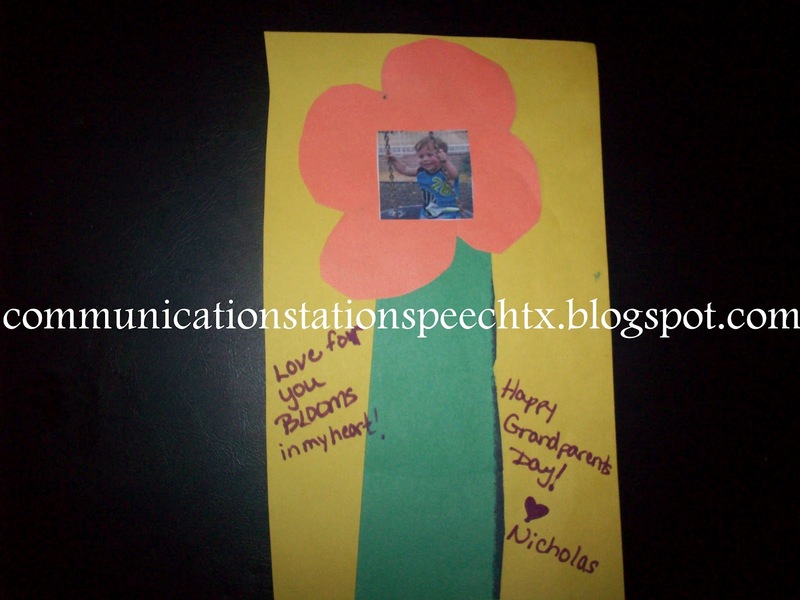 For a simple craft my son and I decided to make a grandparents day card (grandparents day is September 9th of this year). So I searched the site of all sites one goes to for ideas…Pinterest. I saw this cute card where you use a cupcake liner, as a flower bloom and put your child’s face in the middle. I, of course, didn’t have any cupcake liners in my house today…so I tweeked this idea a bit and well…here it is! First I got out all the materials and laid them out on the table. However, I made a ROOKIE MISTAKE and I didn’t make an example of what we where going to make. 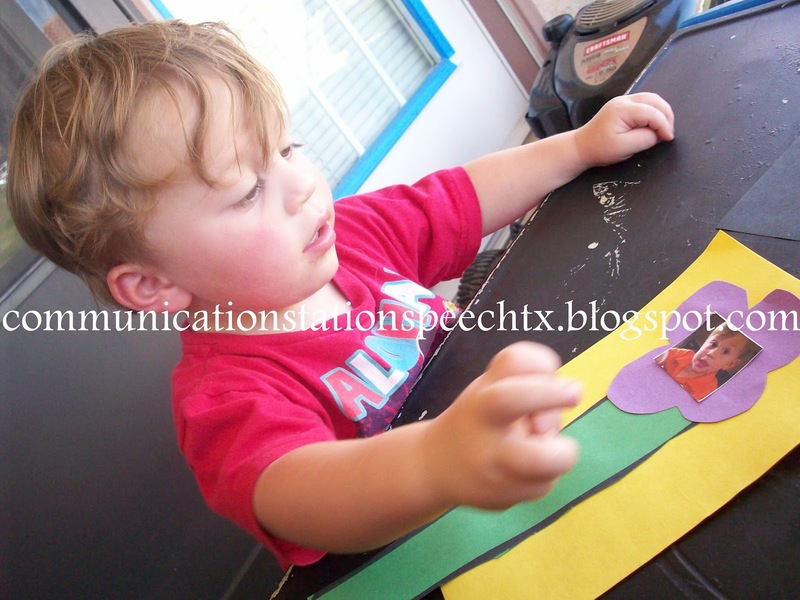 For a two year old…the more visuals the better. So please please remember NOT to make my mistakes at home…make your child an example first! We started by “cutting” stems for the flowers. We talked about what scissors are used for as well as the dangers of using them without adult supervision. Quite a bit of language for one little task but you’d be amazed how much your children will understand and learn just by hearing you talk. With LOTS of help and hand over hand modeling (which is hard as I am a lefty and my son is a righty) we successfully cut our strips of paper!!! If your child is NOT ready for cutting…you can show him/her and talk about these things or just focus on two words “open, close/shut” every time you open an close the scissors to cut. Rhymic repetition is a nice way to practice and model new words. See how his tongue is out! So cute! 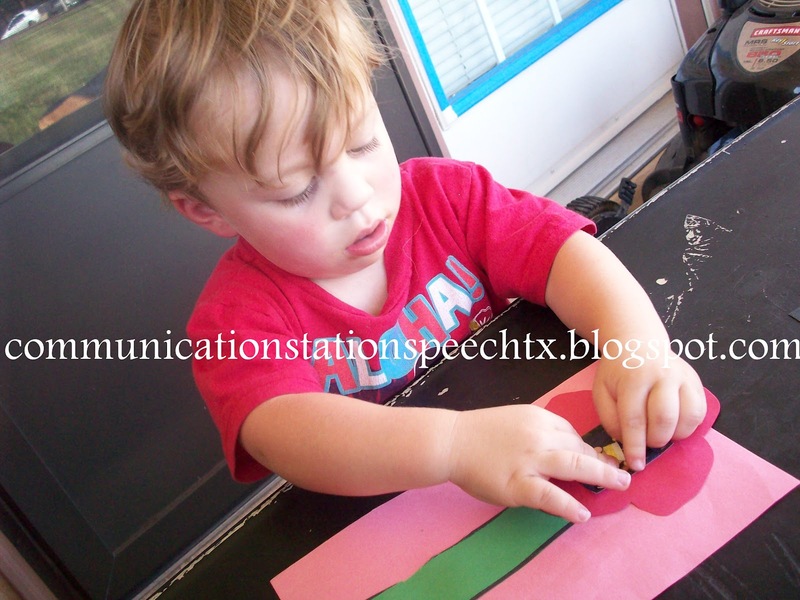 It is not uncommon for children who are concentrating on something difficult to make some sort of face as they are “working”. Many children I have worked with will actually open and close their mouths when they first practice cutting (yes, my son does the same thing) because they are concentrating on that “open, close” movement of their hands. On to the next step, gluing the “flower” onto the TOP of the stem. Great direction following here. He had to remember to turn the flower over, put glue on the back, turn it back over, place it at the top of the stem and hold down. Gluing is a GREAT problem solving activity because of the number of steps a child needs to take to actually get that glued object to stick to the paper! Last step, glue his picture in the CENTER of the flower. It was a new word I used for him. I usually say middle, but I thought I’d extend his vocabulary by using a synonym. Synonms are a GREAT way to quickly expand your child’s vocabulary. Just remember to tell them what it means the first time they hear it! And here is the finished product! Well before we signed our “I love Yous” to it! Because we had to make several cards, it took some time and we made each card in the same sequence. After the first card, I began to ask him “what do we do next” to see if he remembered or could problem solve by looking at the first card he did. 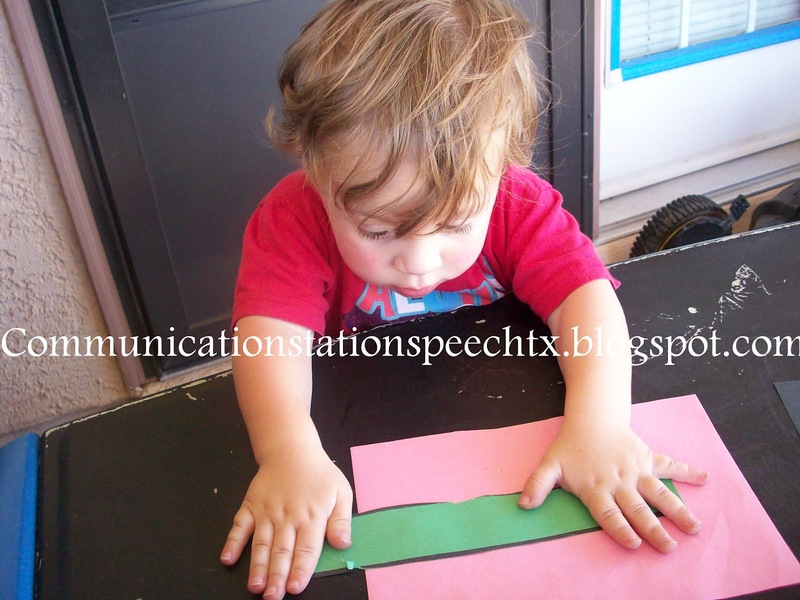 You’ll be surprised how much you child remembers with a simple visual cue. Remember, its not the complexity of the craft…its the kind of language you are using when making the craft. 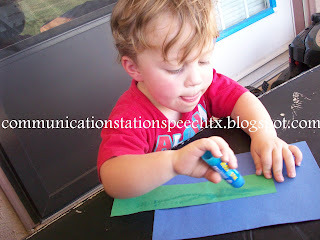 I like to pick crafts that are NOT too complex when I am focusing on language because I want my son to listen to my words more often than trying to figure out how to make a craft! 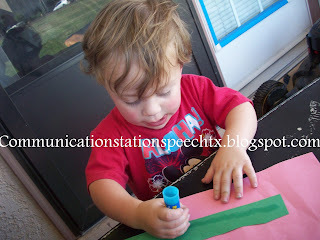 Do you and your children have a favorite craft you like to do at home? How do you incorporate language into it? Please share your ideas by commenting below!